Dan and Josh Veleas are continuing the wrestling family tradition at Berlin. Brad Horrigan – Hartford Courant. This time of year I wasn’t sure there would be a tough of Linked Up-worthy feature stories to include in a new edition. There are so many things going on with seasons concluding and league tournaments in full swing, it seemed feature stories might take a back seat. Shame on me, because this edition has some remarkable stories from across Connecticut. Get ready for a big high school sports weekend with lots of wonderful stories. From WFSB: People like Matt Gingras at Plainville High School are a wonderful part of the fabric of high school sports. 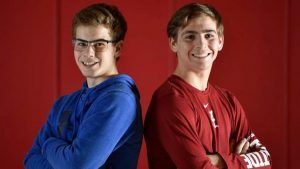 From the Hartford Courant: The Veleas brothers are excelling in the family sport of wrestling at Berlin. From the Norwich Bulletin: Somehow, Montville’s Noah Caskey has raised the bar on the wrestling mat every season. From the Meriden Record Journal: A pair of vaulting standouts for Southington share more than just a sport. From The Day of New London: The New London girls basketball team is succeeding in just about every way possible. From TheRudenReport.com: New Canaan alum Zach Allen showed his priorities with a big decision. From the Hartford Courant: Celebrating a truly selfless act from CREC athletic director Jonathan Winer. From GameTimeCT: An attitude change has helped foster an on-court turnaround for Jonathan Law boys basketball. From the Connecticut Post: The Harding High School gym is closing, but the memories aren’t going anywhere. From CTHShockey.org: A beautifully written piece from a high school hockey parent as the season winds to an end. From GameTimeCT: Larry Vieira has pushed the NFI hockey co-op from Division III to Division I success. From News Team 8: Prince Tech has some big goals for the Division III boys basketball tournament. From the Waterbury Republican American: A pair of well-tested teams will battle for the Berkshire League girls basketball title. From Shore Publishing:: Annea Thaci found her place on the track and helped Old Saybrook to a conference title. From CIACsports.com: A reminder during the heightened emotions of championship and tournament time: please celebrate responsibly. From the Stamford Advocate: With a successful regular season in the books, Notre Dame-Fairfield is eyeing postseason success. From the New Britain Herald: Despite a tough loss, Berlin girls basketball feels good about how its playing.